If you are looking for best spiral vegetable slicer reviews then be sure to check out some of the favorites in this post that are rated highly with consumers. Spiral vegetable slicers are so handy and a must have kitchen gadget for those with an abundance of fresh produce in their garden and anyone else who just wants to eat a healthier diet. They are also great for making faux pasta noodles and other low calorie side dishes for those who follow any type of low calorie, low carb or paleo style diet. Spiral slicers are great for those who are on weight loss plans (saving both carbs and calories) and are nice to have on hand for anyone who has a vegetable garden and is looking for creative ways to use up fresh produce like zucchini, summer squash, cucumbers and more..
Below is information about the most popular spiral vegetable slicers according to Amazon customers, starting with one of their current best sellers. As of this writing, the Spiralizer Tr-Blade vegetable spiral slicer is the current Amazon best seller. It has high carbon 420 grade stainless steel blades, which is considered superior to other blades. The plastic is PBA free, is dishwasher safe and easy to clean. It can easily spiralize zucchini, potatoes, beets, various fruit and more. It also works great for longer fruits and vegetables since you don’t have to cut them into smaller pieces before spiraling. The Paderno Vegetable Spiral Slicer is currently listed as an Amazon’s Choice product. It has three different sets of blades to allow you to create all kinds of cuts. While one blade is attached to the spiralizer the other two store easily into the unit. to use, just attach the fruit or vegetable into the prongs then turn the wheel while pressing the produce into the blade. The Paderno World Cuisine A4982799 Tri-Blade Vegetable Spiral Slicer is also available in the 2-blade basic and the 4-blade pro. The Kitchen Supreme Spiral Slicer Spiralizer complete bundle is a hand held spiralizer that will have you making vegetable spaghetti noodles (zoodles) in no time. You can create noodles as well as all kinds of julienne sliced vegetables out of carrots, zucchini squash, sweet potatoes and more. The bundle includes the spiralizer, ceramic vegetable peeler, cleaning brush, recipe book and a handy storage bag. It is dishwasher safe, and the blades are guaranteed not to rust. The Kitchen Supreme Spiralizer is also on the Amazon best sellers list. 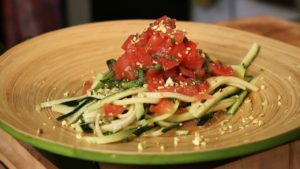 Spiralizing veggies has become a popular way to make tasty recipes out of healthy produce. And while there are many types of spiralizers availabe, these three are some of the best spiralizers according to consumers. A great gadget for adding more vegetables to your diet!